May we suggest that all those readers who have always hankered after owning their own welding equipment head for the premises of Foster and Company on Church Street. Whatever your particular requirements may be, this Lenton business should be able to satisfy them for Foster & Co. confidently assert that they have 'everything for the welder'. They are now considered one of the East Midlands foremost distributors of welding and cutting equipment and suppliers of industrial gases - a range of products all very far removed from the company's first interests when founded back in 1886. In that year Joseph Foster, an official at Bestwood Colliery, decided to go into business for himself. He chose 'coal factoring', which involved buying directly from private collieries and selling to local coal merchants. Based at Wilford Road Coal Yard, Mr. Foster used railway wagons to move his stocks of coal. He was soon operating a fleet of some 400 wagons and began to hire them out to other coal factors. To allow for further expansion he moved to a site on Castle Meadow Road and in 1919 his son, William, joined the company. The coal business continued to prosper but an increasingly important sideline became the building, repair and hiring out of railway wagons. In 1948 the railways were nationalised. As a result all rolling stock was compulsorily purchased, so the wagon division were forced to concentrate on repair work. 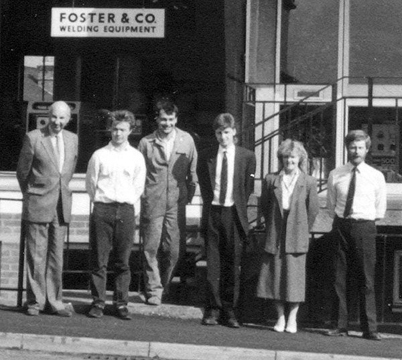 William's son, Gerald (now the senior partner in the company), joined Foster & Co. in 1945 and worked on the repair side of the business. Railway wagons were still predominantly timber framed with repairs on buffer springs and body panels carried out with a sledgehammer, chisel and plenty of muscle power. Gerald Foster began to look into more efficient methods and soon introduced oxygen-acetylene cutting and other more modern technologies. The days of wood framed wagons, however, were numbered, as they made way for all steel wagons. Rather than attempt to convert the business, Foster & Co. sought to use their existing saw-milling equipment for other purposes. The company began to prepare mining timbers from new wood and also from redundant railway sleepers. In the days following the Beeching cuts Foster & Co. were employed to lift railway track, at times at the rate of a mile a day. This required substantial quantities of acetylene, oxygen and propane. William Foster still continued with the coal merchants side of the business after the Second World War, chiefly supplying local schools. But alternative fuels found increasing favour and Foster & Co. gradually ran down this side of the business. 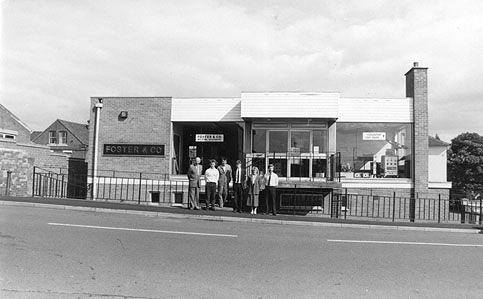 As they were in the market themselves for large quantities of industrial gases, and with an eye to the future, Foster & Co. decided to become the local distributors for Air Products Ltd. The decision to extend their range and include welding equipment followed soon afterwards. Foster & Co. decided to concentrate their efforts on these and quickly established themselves as a leading distributor of welding equipment. It soon became necessary to envisage larger premises. And so in 1975 Foster & Co. moved to a new building on Church Street. Here they have showrooms and offices plus a repair workshop and a trade counter, well stocked with spares and accessories, which is open to the general public. Any readers in Leicester (and we do have some!) may be pleased to learn that Foster & Co. have now opened premises there in Charter Street to enable the firm to cover an even wider area. In the hundred years since its first founding, Foster & Co. have become involved in many rather differing activities. Whether many more twists and turns lie ahead, no one can say. One near certainty, however, is that the family tradition will continue, as Gerald's son, Richard, at present the sales liaison officer, is groomed to take over responsibility for charting the course of Foster & Co.